Leather is a cherished material that provides a unique contemporary attraction to many homes, so finding a dirt mark or stain on your beloved leather sofa before the arrival of some guests might leave you feeling depressed and frustrated. Before you grab the nearest cleaning solution, why not take a look at these helpful, albeit risky leather cleaning tips that might give you the short-term relief you are searching for before getting in-touch with us here at Apple Clean. If the dirt mark you’re dealing with is reasonably new and hasn’t managed to sink its way into the leather, you can wash it by hand for a temporary clean. Start by mixing up a bowl of warm, soapy water. It’s important not to use specialist cleaning solutions without expert guidance as these could potentially damage your leather even more. Castile soap is the best choice for your soapy water and make sure the mixture is lukewarm and full of bubbles before starting. Next, take a cloth or unwanted piece of cotton clothing and soak it in the mixture. 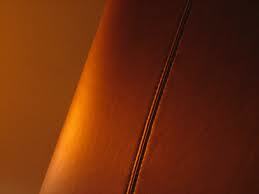 Simply scrub the newly-stained leather with the cloth to get rid of small scuffs and stains. It won’t deal with the problem in the long-term, especially if the stain has proven to be permanent. Nevertheless, it’s ideal if you need a quick and simple cleaning technique. You should let the leather dry if you are cleaning shoes or clothing. This is a risky proposition and should only be used if you’re cleaning something of little significance. You certainly shouldn’t risk expensive leather products in a washing machine. You shouldn’t clean leather with plenty of colouring or delicate details in this way either. The process is relatively straightforward, with the exception of using castile soap rather than you’re usually washing powder or substance. Remember, cleaning leather is a job meant for specialists, so you should only ever clean leather in a washing machine if you’re prepared to risk it. An alternative to cleaning leather yourself is to make the most of our leather cleaning services here at Apple Cleaning. There’s no doubt that the safest option for your leather would be to approach us. We have all the necessary substances and expertise to get your leather looking in great shape once again, with the added bonus of applying a substance that prevents staining in the future.